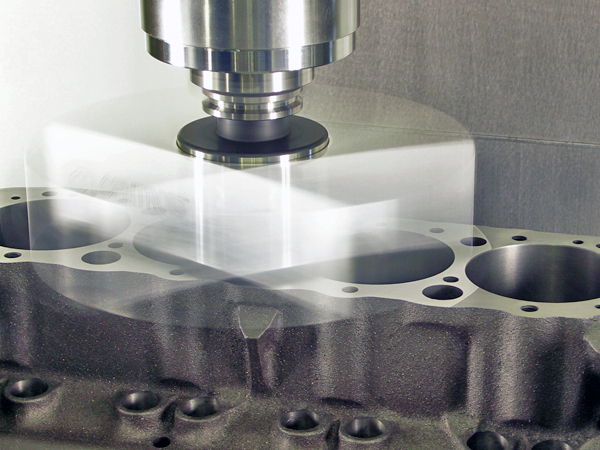 CENTROID CNC Engine Block Machining Center. 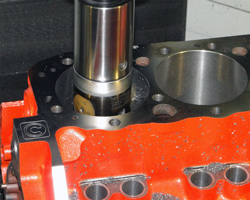 Super wide machine base yields ultra accurate cylinder block CNC boring and surfacing. 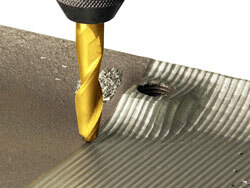 Heavy duty rotary axis and advanced rigid block fixturing provides the industry's best CNC block machine. Machine Blocks and Parts with the same machine. Conversational Programming. 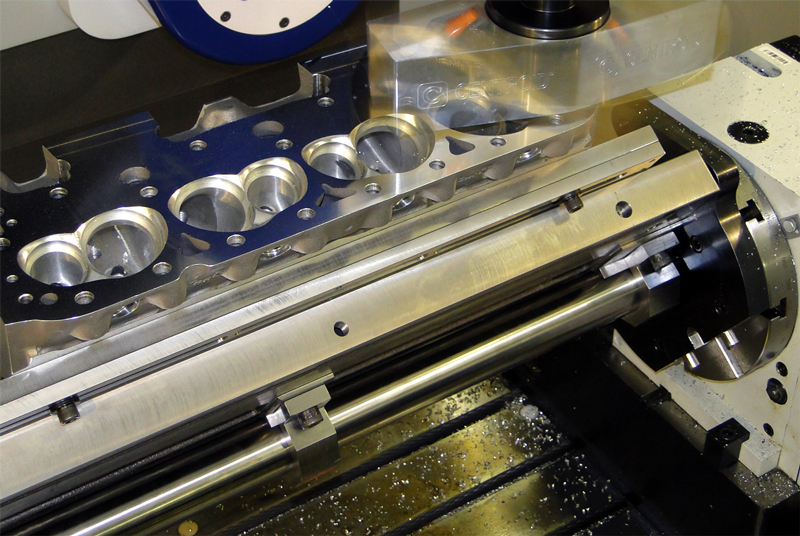 Centroid's new CNC engine block machining Center. 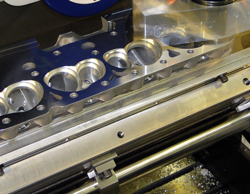 Ccomplete turn-key CNC engine block machining package. 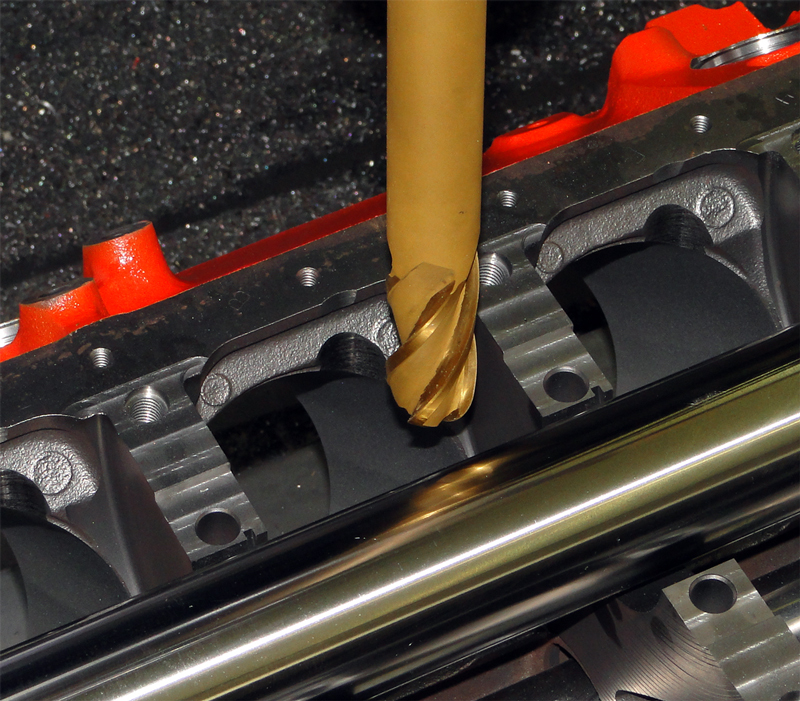 We supply the accessories, tooling and the training so you will be blueprinting and machining blocks in no time. 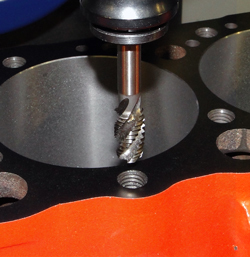 The Centroid CNC will blueprint an engine block faster and more accurately than the competition. Equipped with a 24 tool automatic swing arm tool changer, CENTROID has made advancements to the machine, the block fixturing and the CNC control that allow you to produce accurate race winning cylinder blocks quickly and easily. 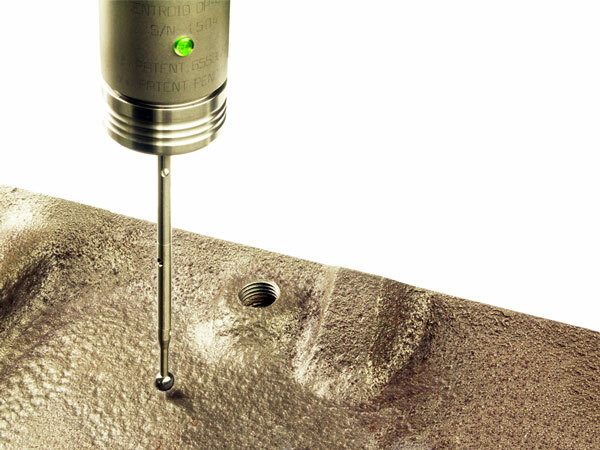 The CENTROID patented digitizing probe will automatically determine the location, diameter and angle of any feature on the block. CENTROID's easy preprogrammed conversational cycles take the hassle out of programming. No G code experience necessary. The actual cnc blue print information is displayed on the screen beside the factory information. Both a table and a graphic display shows the operator the differences, choose to make the appropriate adjustments and then automatically CNC machine the block to the new specifications. Automatic CNC Block Blueprinting: CNC Probing. Blueprinting any block begins by making very accurate measurements of the existing features so corrections can be made. The old way of laborious manual measurement has been eliminated. 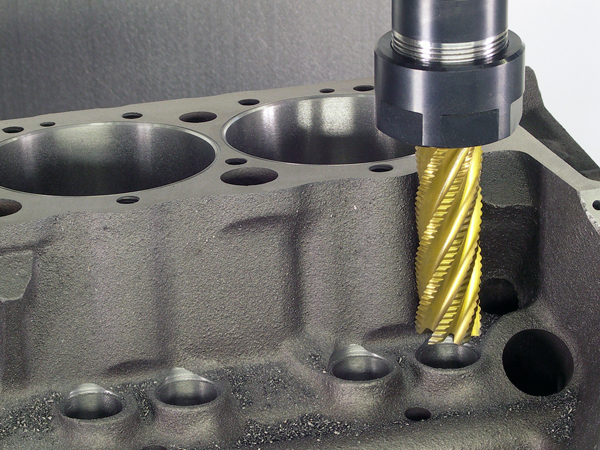 The CENTROID CNC Block machine is equipped with a high tech digitizing probe which automatically locates and measure cylinder bores (diameters, locations and angles), deck heights, and lifter bores with our exclusive easy to use block specific conversational software. To measure an entire block, simply choose the features to blueprint and the probe automatically measures the block and displays the actual diameters and positions of the cylinder bores (and other features) and compares it to the factory specs. The operator then chooses to make any modifications necessary. The CENTROID DP-4 Probe is a state of the art, made-in-USA highly precise probe which can detect in all axis and directions. 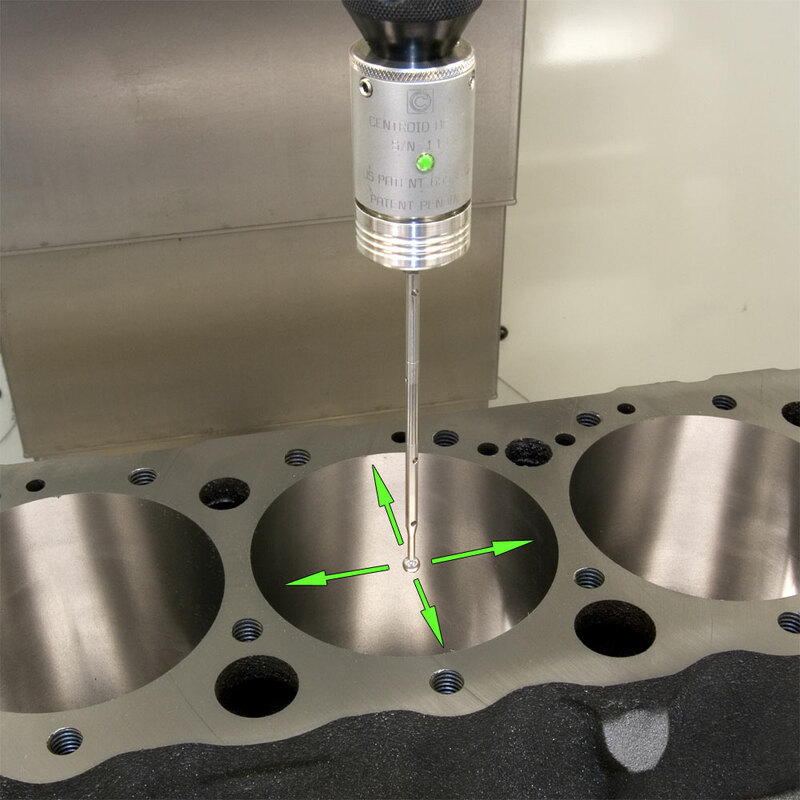 Since the probe is made by CENTROID the entire probing system is integrated and streamlined into the CNC machine, making block digitizing and probing a quick and simple process. Much more accurate, faster and repeatable than manually blueprinting a block! With a quick push button tool change the machine will surface the block to the exact deck height specified. 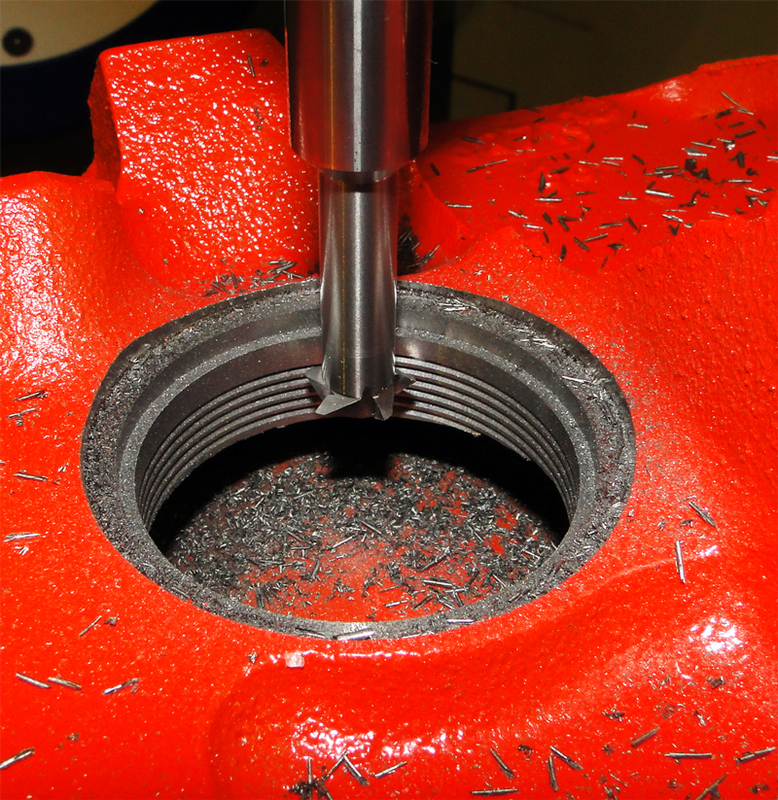 The probe automatically detects the block existing surface height at multiple locations so the operator can choose the proper surface depth to machine to for a perfectly flat and square deck to the cylinder bore. Specialized CNC block surfacing tooling is included which produces incredibly smooth surfaces for superior gasket performance. Automatic Boring cycles are pre programmed and are menu driven with a simple fill-in-the-blank format. 360 degree CNC rotary axis will position the block at the exact blueprint angle automatically. Machine both cylinder banks with the same setup. Block data base saves your work for future jobs. Bore on probed centers, Blueprint or any other specified location. Specialized boring tooling included. Quick, simple programming gets the job done accurately the first time. Operators program the block work to be done right at the machine. Head Stud conversion, automatic, drill, counter bore and tap... just takes minutes. Convert blocks for head studs with ease. The machine will automatically drill out the exisiting threads counter bore the lead in and rigid tap (or threadmill) the threads to accept the new head studs. 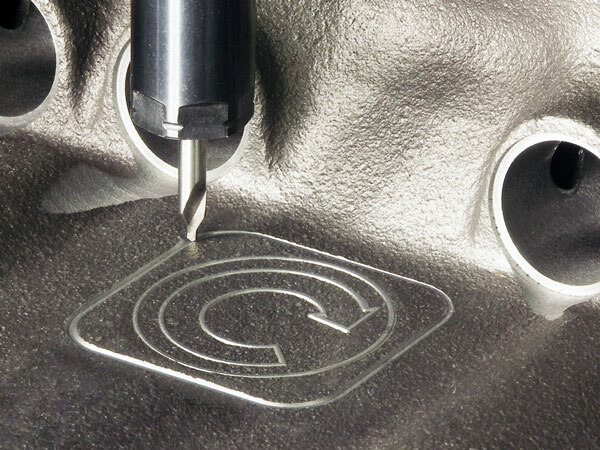 The CENTROID user friendly CNC Block software is conversational format which means all you have to do is fill in the blanks with the basic block information, no need to go out of house or learn G-codes, our easy to learn Block Software is made specifically for engine builders saving you time. 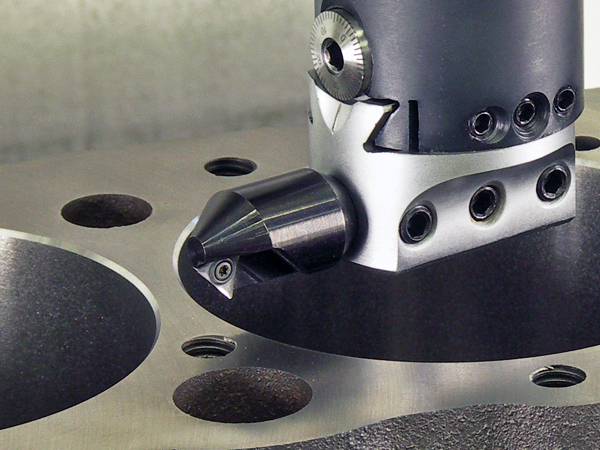 You can save all of your programs and base new ones off of existing work, building a custom group of block machining programs specific to you applications! 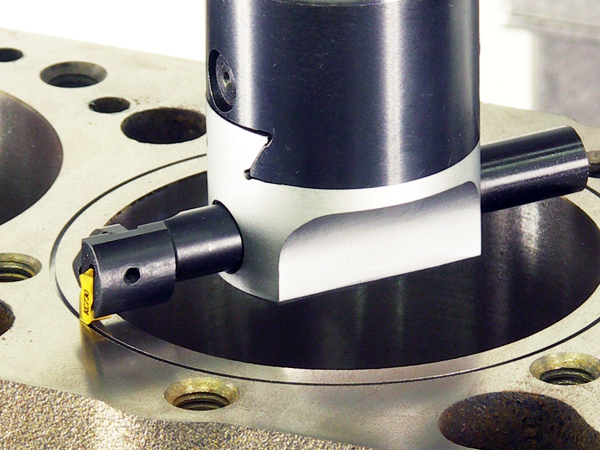 Machine lifter bores to the exact diameter, location and angle needed with one simple setup. True up the stock size and location or bore complete new diameter, location or angle. Easily control feed and speed within the CENTROID conversational software, the computer remembers your data for the next job as well, no need to reprogram. Easy manual override of programmed feeds and speeds via the operator control panel makes fine tuning adjustments easy to do on the fly. Spot Face Lifter bores automatically. 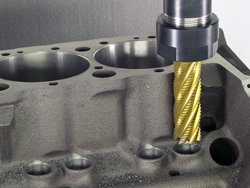 You have the ability to create and save your programs with CENTROID user friendly CNC Block software. No need to go out of house or learn G codes, our easy to learn Block Software is made specifically for engine builders saving you time. 4 bolt Main Bearing Cap Conversion. The best way to accurately convert a block to 4 bolt mains. 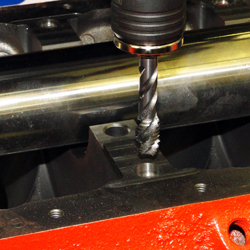 Automatic CNC drill and tap routines are pre programmed, the operator simply answers a few questions and the machine does the rest. 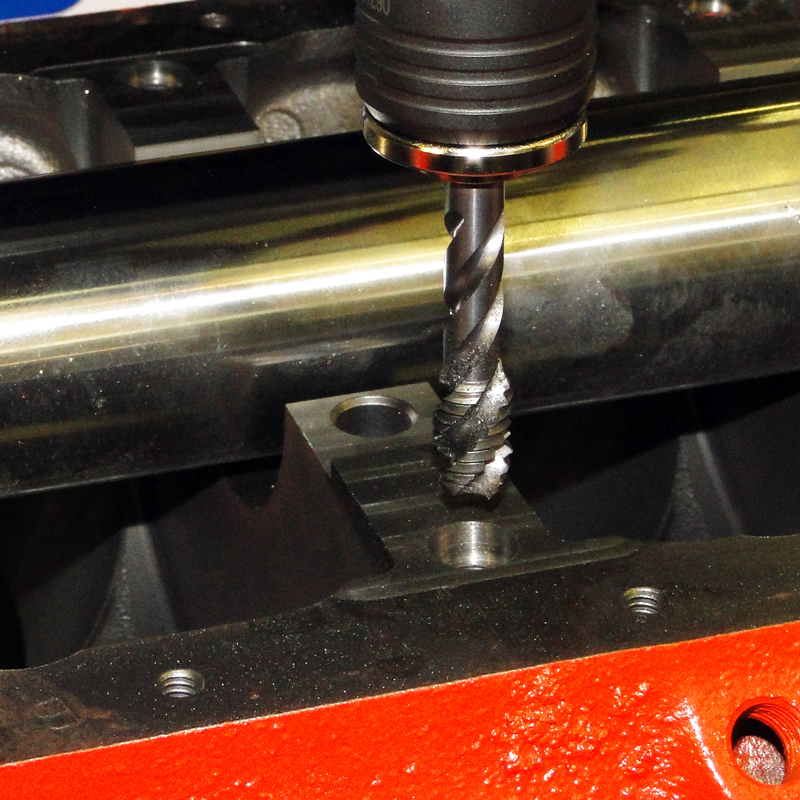 CNC Angle Drilling and tapping for perfect 4 bolt main conversions. 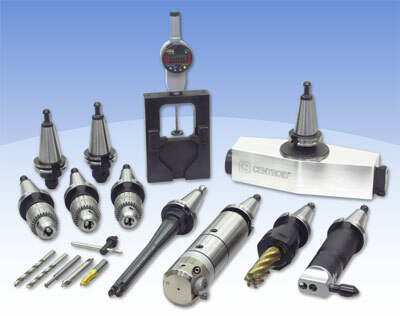 Chamfer cylinders automatically. Operators specifies amount of chamfer. Machine chamfers perfectly concentric with bore. Add O-ring grooves the the deck of any block. Any width and any depth, operator specifies oring specs and the machine does the rest. note: o-ring tooling is optional. Automatically remove excess material. The probe copies the shape of the block and creates a tool path that perfectly matches the contour of every detail. Choose the amount of material to remove and press cycle start and the tool will machine the block surface to your specs. 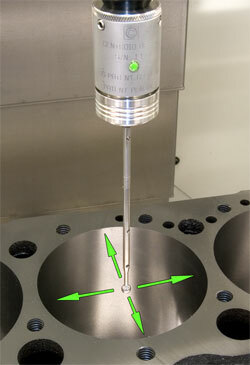 CENTROID threadmilling canned cycle provides easy fill in the blank programming. Threadmill the threads on blocks and heads. Never break a tap again! 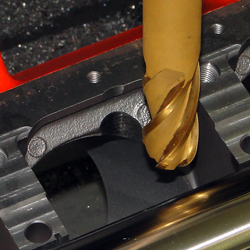 In general, for production threading up to 3/8", taps are more efficient. However, if producing a wide variety of parts, threads, and materials on the same machine, threads mill are far more versatile. They will produce right or left hand, internal or external threads, single or multiple lead from #2-56 with the same mill. Materials range from soft, non-ferrous alloys to heat-treated steels, or tough alloys such inconel and titanium, where tap breakage often occurs. Pipe threads are easily produced without leaving the normal “stop lines” and creating the troublesome stringy chips normally produced by taps. In addition, thread mills can produce full threads to within one pitch of the bottom of a blind hole. Quickly and easily engrave letters, numbers, symbols and logos. Phone numbers, serial numbers, web addresses and company logos are now simple to automatically add onto every block you blueprint. 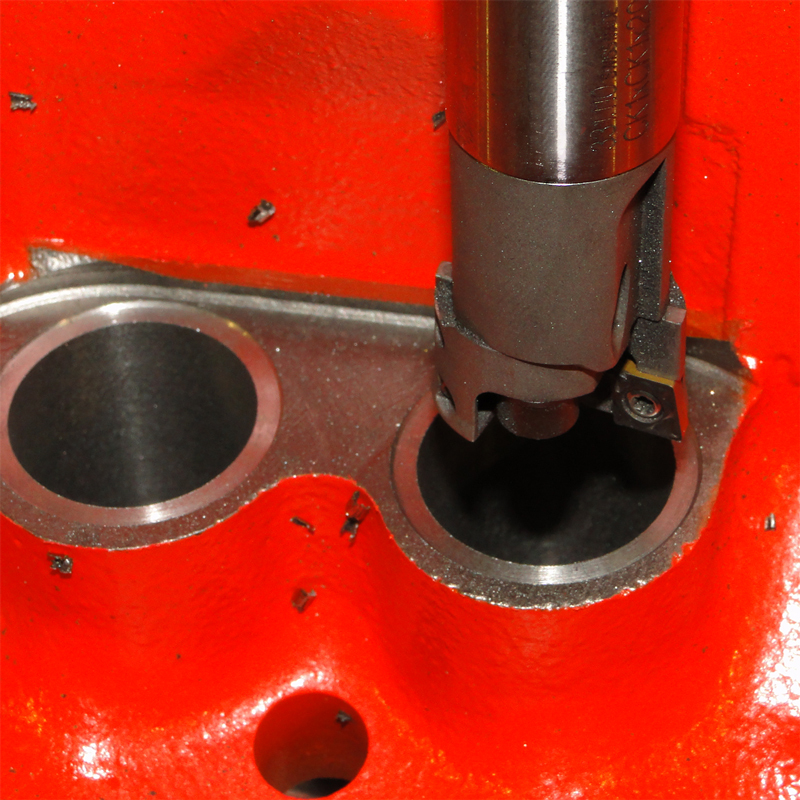 Easily machine clearance paths in the block for big stroker cranks. Cylinder Head surfacing! Acheive incredible Ra's. Switch from Block work to Cylinder head surfacing in minutes, surface heads better and faster than a dedicated surfacing machine. Super Low Ra's will make your customers happy. CENTROID includes a high quality tooling package with each machine to get you up and running quickly! 2420 lb table max load! Precision C5 double nut ground ballscrews. 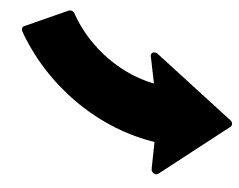 Quick push button tool changes. Touch Screen, Windows OS, Touch screen, Quad core, SSD, USB and wifi standard. Our CNC Block conversational software is a integrated part of the control system. This quick and simple to use Block specific software guides you thru the process with graphics and a simple fill in the blank format. Our Block blueprint data base is standard and expandable, nothing extra to buy. Operators can easily add their own work to the data base. The control remembers all your data and programs. Easy transfer to a USB thumb drive for backup & safe keeping, USB 2.0 ports are a standard feature of the PC based CENTROID cnc control along with a robust solid state hard drive made for harsh environments for reliable operation for years to come. A large color LCD screen with an anti glare layer makes the control easy on the eyes, grease and chip proof. The operator control panel has dedicated buttons for common machine functions that makes the control simple and intuitive to use. The included electronic remote hand wheel makes block setups quick, accurate and easy. Simply turn the dial to move a machine axis, a selection of increments on the dial allows fine adjustments. The control stand itself allows and operator to stand or sit with a comfortable working position. Both models are equipped with the following capabilities yet not limited to: Automatic CNC Blueprinting, Boring (rough and finish), Surfacing, Lifter boring and facing, Engraving, Block digitizing and material removal for block lightening, Auto probing finds any and all dimensional data, O-ring grooves, push rod clearance machining, stroker rod clearance machining, drilling and rigid tapping, 4 bolt main conversions, splayed caps, chamfering, shell milling and any general 3 or 4 axis machining work including 3D digitizing!